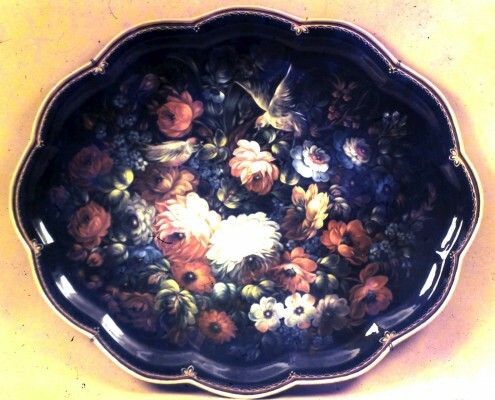 The term ‘Japanware’ is used to describe objects which have been finished and decorated in a particular way. A ‘Japan’ finish can be created on lots of different materials. ‘Japanning’ means the finished, protective/decorative surface and not the article itself. ‘Japanning’ is a method of protection combined with a style of decoration, originally used in the east in India, China and Japan. 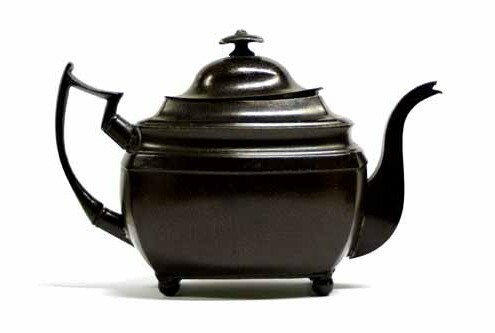 Japanning can be used on a variety of surfaces; however Japanned tin goods were first produced in Pontypool, South Wales in the 1730s. The craft spread quickly to the industrial areas of the Midlands; Birmingham, Wolverhampton, Bilston and also to Usk, Monmouthshire. Use this site to learn about the history of Japanware and find details of the Museums and Galleries where pieces can be viewed. 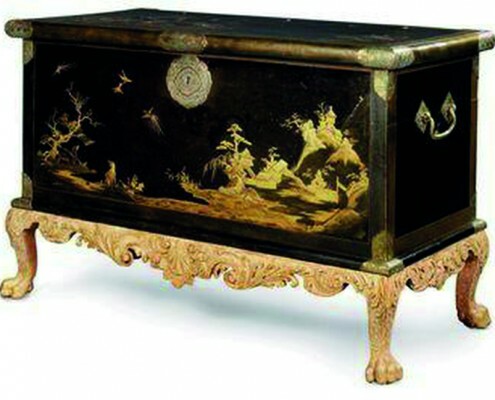 In the 6th Century, the Chinese developed a way of applying different coloured varnishes onto items of furniture. Part of the process involved baking the items so that the layers of varnish or lacquer became much harder than ordinary painted surfaces. 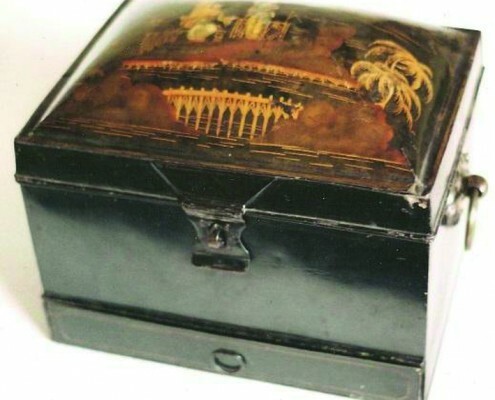 This lacquering process usually involved decorating the object with designs. The designs were often extremely beautiful. There were floral designs, pictures of castles and temples and attractive landscapes, usually using black as a ground colour with gold decoration. The craftspeople that produced these designs used paint as well as mother of pearl and precious metals, including gold dust. Once the designs were finished, they were painted over with many layers of varnish. This was then baked to protect the decorations as well as the objects themselves. Even items made out of papier-mâché could stand up to every day use when given such a finish. The Japanese soon learned to copy the process and began to produce items of furniture, which were equally elegant and beautiful. In the 16th century, Dutch traders began to bring examples back to Europe as merchants opened up links with Japan. They brought back beautiful screens and cabinets as well as other items of furniture and it was from this that the name ‘Japanning’ became known. The objects themselves were described as ‘Japanned Ware’ and then in South Wales where Japanned metal goods originated, they became known as ‘Japanware’. As wealthy British travelers in Europe brought examples of Japanned goods back to the UK, it was not long before it became highly sought after. 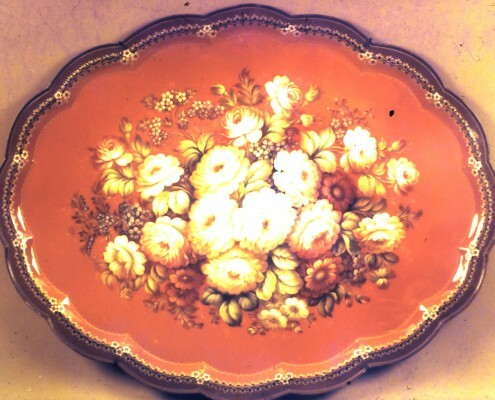 European joiners began to copy these items, but because of the limited range of varnishes, the finished articles were often inferior to the real thing. Please read the sections ‘Japanware in Pontypool’ and Japanware in Usk’ before starting on the resources. Download the Teachers Guide for Japanware exercises and activities.